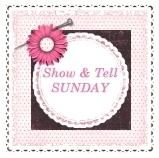 Today I'm combining posts for Pink Saturday and 30 Days of Junkin' Day 4. Pink Saturday is hosted by Beverly at How Sweet The Sound. Visit Beverly for a full list of this week's participants, and please keep Beverly's mother in your prayers as she continues to heal. These are just a few pieces of vintage and handcrafted jewelry I've purchased while out junkin'. The four pairs of pink lucite earrings are from the 1960s, and were still on their original cards when I bought them in a $1 grab bag at a garage sale. I love wearing the faceted dangly ones, made for pierced ears. The other 3 pairs are clip-ons, and I'm still not sure how women of my mother's and grandmother's generation wore them all day long. The button pin is a 3 inch wooden heart from the craft store, painted pink, with vintage buttons hot-glued to the front and a bar pin hot-glued to the back. I bought it at a Christmas boutique/craft fair held in someone's home, and I think I paid $3 ... I've had it for at least a dozen years or longer. The freshwater pearls are a beautiful pale pink, though it's hard to tell in the photo. They're strung on sturdy coiled wire, so that they wrap around my wrist about 2 1/2 times, and they look terrific anywhere and everywhere ... at work, out to dinner, or on the beach. I bought them from a crafter at a flea market in Hawaii five or six years ago, and paid less than $5.00. Flea markets, swap meets, craft fairs, and antiques shows are all super sources for inexpensive jewelry, and they're fun and affordable places to build your collections, find unique gifts, and enjoy an afternoon in the sun. Something extra: Many craft fairs and flea markets are now welcoming sellers of locally-grown foods, which not only provides healthier snack choices, but also conveniently combines the freshness of the farmer's market -- including local artisan breads and cheeses, fresh herbs and eggs, independently grown flowers and bedding plants, and plant-ripened organic fruits and veggies -- with the fun of going junkin' ... how cool is that? One stop shopping on a Saturday morning, while saving time, money, and gas, and supporting sustainable agriculture. That's my kind of shopping! Today's question: Where is your favorite outdoor place to shop?